Tallulah is back in ballet class and now she wants to go en pointe—to dance up on the tips of her toes in pink satin toe shoes, like a real ballerina. But going en pointe is not good for growing feet, and her ballet teacher says her feet aren't ready yet. Oh, yes, they are, Tallulah thinks. And so am I. Not only is she ready, she's determined. And nothing stops Tallulah when her mind is made up! "Singer once again wisely presents a quandary faced by many little ballerinas and any other child who is told to postpone immediate gratification . 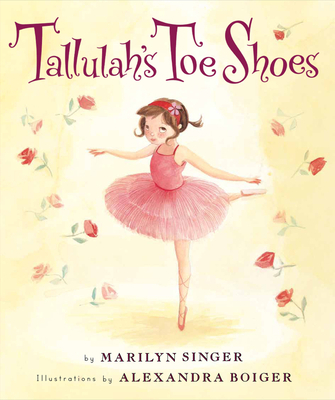 . . Little girls in tutus and little girls who dream big will find that Tallulah is a kindred spirit . . . A charming entry in the ongoing saga of Tallulah." "As with the previous two books, Singer and Boiger deliver the story's message with a lightness and grace befitting the subject matter, and Tallulah remains a highly empathetic heroine." "Children who love ballet will love this one and want to read the other titles in this series."